Bina007 Movie Reviews: London Film Fest 2012 Day 3 - SAVE YOUR LEGS! I love cricket. I love cinema. I'm almost pre-programmed to love this film. And love this film I did! I laughed out loud all the way through, I loved the characters, and I willed them to win. For me, SAVE YOUR LEGS! was basically the perfect comedy. But what I hope I'll do in the rest of this review is convince you that even if you neither know nor care about cricket, you'll have a good time watching the film. The movie is based on the real life escapades on a bunch of Aussie park cricketers who went on a tour of India in 2001 to participate in a scratch tournament. The lads had fun, got high, got Delhi Belly and played some cricket. The tour became the basis of a documentary, and now a feature film, both called SAVE YOUR LEGS! The big theme of the movie is what happens to long-lived male friendship when blokes hit that mid-30s mark, get married, have kids, and have to take the wife to Ikea rather than play cricket on the weekend. 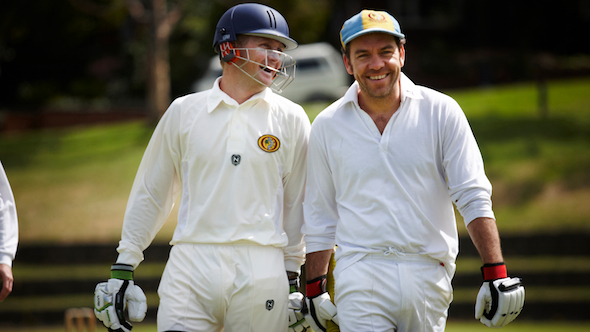 The hold-out in this crew is Teddy (Stephen Curry), the likeable and earnest club president who arranges the tour to try and keep the group together for one last hurrah before his best mate, opening batsman, and hard-drinking good-time boy Rick (Brendan Cowell) gets married. Along for the ride are the club's hilarious show-pony Stavros (Damon Gameau) and the sponsor's pretty daughter Anjali (Pallavi Sharda), to provide a love interest for Teddy. To be sure, there's a layer of humour that comes from being a cricket fan - seeing a scoreboard in a limited overs match with a score in the high 300s makes you laugh because you know our beloved Aussie team is screwed. And in a pivotal final scene, it helps if you know a bit about the mechanics of calling for a run to get what Stav is doing with the Boycottian Teddy. But if all that means nothing to you never fear. There are only small flashes of sport in the flick and they are pretty self-explanatory (I checked this by taking Dr. 007 along and he knows nothing about cricket having been tragically raised in a non-Commonwealth country). The big themes of the movie are widely relatable - the challenges of keeping up male friendship in mid-life; the challenges of travelling in India; or the sad reality that eventually, a younger better kid is gonna make us look sadly old-hat - what I call LCD Soundsystem Syndrome. All of that is just straightforward bromantic comedy of the type found in movies like THE HANGOVER, and what's more, it really works! I loved the larger than life characters - the brash arrogance of Stav, the dishevelled loutishness of Ken, and seeing uptight Teddy loosen up. I even loved the Bollywood ending and the brilliant use of 1970s Bollywood rock'n'roll classics all the way through the movie. Mark Wareham's cinematography captures the beauty and craziness of India in equal measure. So whether or not you're a fan of cricket, if you just want a good night out at the flicks, this is the movie for you. SAVE YOUR LEGS! played London 2012 and will be released in Australia on Jan 24th 2013.